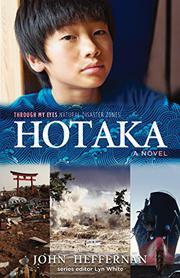 A fictionalized narrative follows a young survivor of the 2011 tsunami in Japan and looks at how his life and town change in its wake. Hotaka Yamato (his name is rendered in the Western fashion, with family name second) and his best friend, Takeshi, are planning to see a puppet show when an earthquake suddenly hits near their seaside town. A tsunami soon follows, and their tiny village is devastated. Hotaka survives, but many do not; he is one of the fortunate residents who live on the higher grounds and is able to escape the rising waters. Three years later, the denizens are still coping with the disaster, and while the town is beginning to rebuild, the burgeoning seawall has left many residents angry. Hotaka’s classmate Sakura in particular hates the wall, along with the political corruption and sharp socio-economic division it embodies. When she and her friends protest the seawall, violence against the teens and their families ensues. Heffernan’s dramatic account spares its readers little, using its propulsive plotting to highlight not only the immediate devastation of the tsunami, but also its lingering effects. Helpful addenda include a glossary of Japanese words, historical timeline, and sources for additional reading. Fans aging out of the popular I Survived…series may appreciate the same quick pacing and the deeper dive into the aftermath of a natural disaster.